This section is being developed in response to requests for material on New Zealand examples of evolution, and will be added to as new information becomes available. In 1979 Sir Charles Fleming proposed that the closely related kea and kaka evolved quite recently from a "proto-kaka" population as this population was widespread over NZ during the Miocene, but was separated into two early in the Pleistocene. In Fleming's hypothesis, adaptive radiation of these populations saw the evolution of the kea (Nestor notabilis) and kaka (N. meridionalis), which are now sympatric in the South Island; the kaka has also formed subspecies on either side of Cook Strait. Fleming explained that the environmental changes influencing the evolution of these new species were the appearance of the Southern Alps (permitting the evolution of a new alpine biota) and the changing sea levels associated with the last Ice Ages. However, recent DNA studies of kea and kaka, and of our other large parrot, the kakapo, reveal a somewhat more complex history for the group. This began 100 million years ago with the break-up of Gondwanaland and formation of the Tasman Sea, when an area that included New Zealand moved away from Australia, taking with it the ancestral proto-kaka, "large parrot", species. The kakapo (Strigops) diverged from the kea/kaka lineage (Nestor) about 60-80 million years ago, through ecological divergence. Around 5 million years ago, early in the Pliocene epoch, the Southern Alps began to develop. This generated the first alpine environments in NZ for perhaps 50 million years, providing the opportunity for the kea to evolve from the proto-kaka species. With the Pleistocene glaciations came new environmental pressures. During glacial periods sea levels fell, so that at times the North and South Islands were a single landmass, and forests retreated from many regions as the ice advanced, restricting the distribution of kaka. This pattern was reversed in the warmer interglacial periods. These changes allowed the development of subspecies of kaka in the North and South Islands, and a series of migrations saw the development of (now extinct) kaka subspecies on Norfolk Island and the Chathams. Kea and South Island kaka had become sympatric by the end of the last glaciation. As well as the "large parrot" grouping of kea, kaka, and kakapo, New Zealand has several kakariki species (Cyanoramphus spp.). The ancestor of this group arrived in New Zealand about 0.5 million years ago, probably from New Caledonia, and underwent considerable adaptive radiation to produce the 8 living New Zealand species of Cyanoramphus recognised today. Dates determined for the evolution of these species using mitochondrial DNA suggest that the most ancient of this group is the Chatham Islands parakeet (Forbes' parakeet, C. forbesi), which first arose about 440,000 years ago, with the remaining species evolving at various times between 280,000 and 30,000 years ago. This high degree of speciation (there are also a Norfolk Island species and two extinct species from the Pacific region) was brought about by migration and isolation (allopatry) and by ecological and behavioural divergence. While the ancestor of Cyanoramphus must have crossed open water to reach New Zealand, this would have been made easier during glacial periods, when the separation of Norfolk and the Chatham Islands and NZ would have been less due to markedly lowered sea levels. The dates of these glacials closely match the DNA-derived dates for the appearance of several of the parakeet species. The phylogenetic relationships of New Zealand geckos have also been studied using DNA techniques. New Zealand has two endemic genera of geckos: Hoplodactylus, the nocturnal brown geckos, and Naultinus, the diurnal green geckos. The New Zealand geckos form a monophyletic group with the New Caledonian species and one Australian genus (other Australian taxa are more distantly related). It is likely that the New Zealand geckos have evolved separately since the development of the Tasman Sea began New Zealand's isolation from the rest of Gondwana around 100 million years ago. Between them the two genera of gecko show a very high degree of adaptive radiation, with a combined total of at least 37 species. DNA evidence suggests that adaptive radiation producing the current diversity of gecko species occurred after the Oligocene (perhaps 24 million years ago). It further suggests that the brown geckos, as a group, began to diversify well before the green taxa, which in turn began to speciate less than 5 million years ago. New Zealand was substantially submerged during the Oligocene, which would have produced many isolated populations that could then diverge ecologically and behaviourally from each other. The New Zealand cicada group is quite diverse, with around 40 species inhabiting almost all possible terrestrial habitats, from the alpine zones to coastal dunes. Analyses of mitochondrial DNA have been used to determine both the biogeographical origin and evolutionary relationships of New Zealand's five cicada genera, and the evolution of the genus Maoricicada, whose 14 species are predominantly alpine in distribution. DNA analysis suggests that the original members of the Maoricicada group initially occupied lowland habitat after their arrival from New Caledonia, later radiating into sub-alpine and high alpine species. This pattern reflects the way that the New Zealand environment changed after the late Miocene, with tectonic activity leading to the uplift of the Southern Alps and the appearance of the first alpine habitat in perhaps 50 million years. It appears that cicadas reached New Zealand on two different occasions, both less than 24 million years ago, and then underwent considerable evolution as they adapted to their new environment. The first dispersal appears to have come from Australia, and the second from New Caledonia as the New Zealand genera are related to New Caledonian and Australian taxa. We are grateful to Dr Geoff Chambers, from the Institute for Molecular Systematics (School of Biological Sciences) at Victoria University, for providing us with the information on kea, kaka, kakapo, karariki, geckos, and cicadas. New Zealand separated from the Gondwanaland mainland around 85 million years ago and has been effectively separated from Australia, by the Tasman Sea, for about 55 million years. Because of the distances involved (2,000 km across the Tasman) it's long been assumed that many of the plant groups New Zealand shares with the Australian mainland - including the ferns - have evolved separately since the initial Gondwanaland split. However, in 2001 it was suggested that most New Zealand ferns had evolved more recently, meaning that they must have reached New Zealand by long-distance dispersal of their spores. In addition, 95 of the 105 fern species indigenous to New Zealand are also found in Australia, Norfolk Island, and/or Lord Howe Island (Australasia). It's highly unlikely that these ferns would be so similar if their last common ancestor lived 85 million years ago; a more likely hypothesis is that they originated more recently and dispersed across the Tasman Sea. Twelve species of Polystichum ferns are found in temperate Australasia. Six of these are endemic to New Zealand e.g. the common shield fern, or pikopiko four to Australia, and two are found only on Lord Howe Island. DNA analysis (using chloroplast DNA sequences and DNA fingerprinting) was used to determine the evolutionary relationships between these species, and to decide whether their distribution could be best explained by dispersal or vicariance. The fossil record - which is particularly good for ferns - was used to give likely times of divergence between the different species. A phylogenetic tree constructed using the DNA data shows a clear division between "New Zealand" and "non-New Zealand" species. This means that all New Zealand species of Polystichum are more closely related to each other than to any other members of the group. A combination of chloroplast sequences and fossil data suggest that the split between New Zealand and Australian Polystichum happened about 13 million years ago. Thus the New Zealand species can't be traced back to a Gondwanaland origin, but must have arrived much more recently, by long-distance dispersal across the Tasman Sea. There is no evidence to support the hypothesis that Polystichum ferns crossed the Tasman more than once. 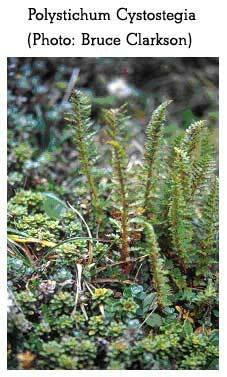 Thus the New Zealand Polystichum ferns represent a monophyletic group. They have undergone considerable adaptive radiation since arriving here, to occupy habitats from coastal to alpine regions, and from well-lit forest margins to the dark forest understorey. This radiation must have occurred within the last 13 million years, although it has not been dated more precisely, but could well be related to the significant ecological changes accompanying the Pleistocene glaciations. Polyploidy is the presence of more than two chromosome sets in a somatic cell (e.g. 3N, 4N). It can occur as a result of non-disjunction during meiosis, so that some of the gametes are diploid (2N) rather than the usual haploid (N) condition. If a diploid egg (produced by non-disjunction) is fertilised by a normal sperm then the resulting zygote will be triploid (3N). Similarly, fusion of two diploid gametes will result in a tetraploid hybrid (4N). Polyploidy is relatively common in plants, and can be involved in sympatric speciation. The new polyploid organisms can interbreed with other individuals with the same chromosome set, but not with their original parents i.e. they are separated from the parent species by a reproductive isolating mechanism. Many common food plants are polyploids, including wheat, cotton, oats, and potatoes. In New Zealand, the genus Melicytus comprises 11 species, including mahoe. Seven of these species are diploid (with 2N = 32). They all have unisexual flowers and grow as trees or tall shrubs. There are two tetraploid species (2N = 64), both of which have hermaphrodite flowers and a divaricating shrub habit, and one hexaploid (2N = 96), which has unisexual flowers but also grows as a divaricating shrub. 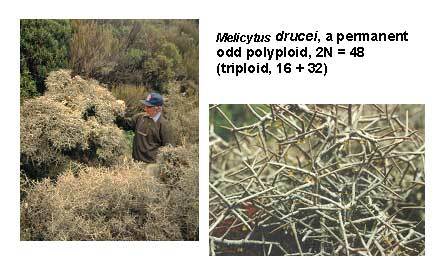 The remaining species, the rare Melicytus drucei, is the first stable triploid species (2N = 48) identified in this genus. It is a hermaphrodite shrub with unisexual flowers. 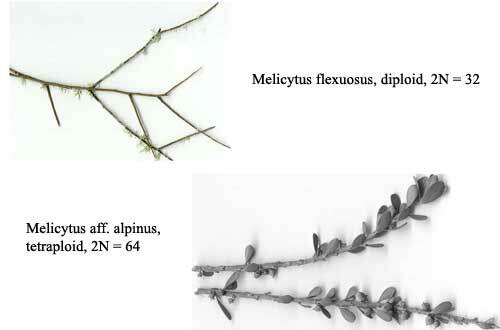 M. drucei is most similar morphologically to the diploid M. flexuosus but in height and flower type it resembles a member of the 4N alpinus group, supporting the conclusion that it is a hybrid between these two species. It is found only in a restricted area in Egmont National Park. Both the likely parent species are found in the central North Island, though not in Egmont National Park. M. drucei is found only on Pouakai volcano. This peak is only 250,000 years old, suggesting that drucei has a recent evolutionary origin. The polyploidy event that gave rise to drucei may have occurred during a period of harsh climatic conditions (a glacial period of the Pleistocene Ice Age) when the two parent species were more widespread. Adelie penguins breed in large colonies in the Antarctic, where their current population size is approximately 10 million birds. They nest only in ice-free areas with ready access to open water - this is essential as the parents must go on regular fishing trips to feed their young once they've hatched - and return to the same area each year to breed. The birds are strongly philopatric and some of these colony sites carry a continuous record of occupation that extends back over 7,000 years into the past. 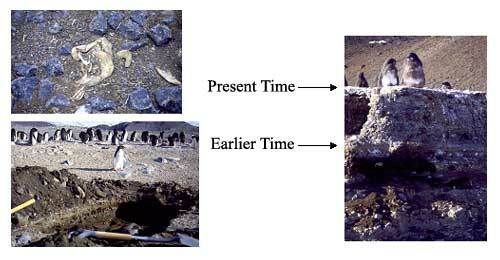 Digging down through the soil beneath a colony can expose various levels of occupation and - importantly for studying the genetic history of the Adelie populations - these levels contain bones and other material from which DNA can be extracted. The levels can also be accurately dated using radiocarbon techniques. This means that comparisons of mitochondrial DNA extracted from ancient bones and living birds at a single site, and from sites around the continent, can be used to study rates of genetic change, and hence of evolution within the penguin populations, over time. The research team discovered large numbers of mitochondrial DNA haplotypes, and also found that a number of the ancient haplotypes had gone extinct. From this data, they were able to determine that allele frequencies in the various penguin populations sampled were changing more rapidly, and hence the populations were evolving more rapidly, than predicted by other phylogenetic analyses. This is clearly shown in the following illustration, where each pie graph represents the haplotype frequencies in a particular Adelie population. What drives these rapid changes in gene frequency? One possible cause is the severe disruption to breeding colonies caused by loss of access to open water during the fledgling period. 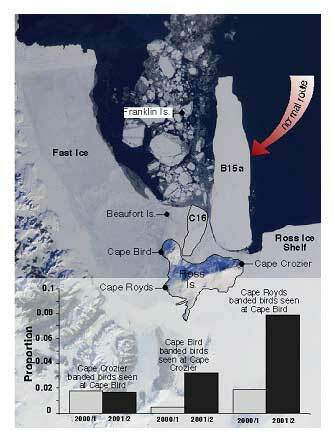 In recent years breeding at some colonies failed completely as the result of a large iceberg breaking off the Ross Ice Shelf and lodging against the northern part of Ross Island. This disrupted normal ocean currents and meant that the sea ice failed to break up in summer, thus preventing adult birds from foraging successfully for their chicks. 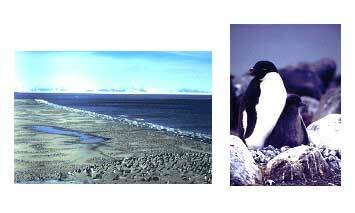 There was huge chick mortality and many adults appeared at other breeding colonies in subsequent years. We are very grateful to Professor David Lambert and his colleagues, from Massey University's Institute of Molecular Biosciences and the Allan Wilson Centre, for providing the information used in this section. All photographs and figures courtesy of David Lambert. New Zealand has amazing and interesting land snails that can be nowhere else found in the world. They belong to the unique fauna of invertebrates and belong to the mollusc phylum. Over New Zealand�s history these forest-dwelling snails have evolved into over 1000 species of land snails. This number has diminished now and some of the surviving snail species are very rare. The land snails are one of New Zealand�s oldest groups of animals, and along with tuatara, weta and some frogs have been here since before New Zealand separated from Gondwanaland, 80 million years ago. The New Zealand flax snails (Placostylus), or pupu harakeke, are rare land snails that live in the northern half of Northland and adjacent offshore islands. Placostylus (Basileostylus) bollonsi Suter, with three subspecies, restricted to the Three Kings Islands, 50 km northwest of North Cape. Placostylus (Maoristylus) ambagiosus Suter, with 15 subspecies, between Cape Maria van Dieman and North Cape. Placostylus (Maoristylus) hongii (Lesson), with no recognised subspecies, is found on several offshore islands between Whangaroa and Great Barrier Island and some mainland localities north of Whangarei. Placostylus (flax snails) are often found in flax bushes, hence their name. However, flax is not their main food, and they prefer forest vegetation that contains salt from sea spray. These nocturnal snails feed on moist fallen leaves and often hide under leaf litter during the day. Their shells are long and pointed, and the animals can weigh 17 g and reach a length of 115 mm. They take about four years to mature. In winter they lay 6mm-long eggs and often several snails add their eggs to the same nest, which can contain up to 30 eggs. In spring the young hatchlings leave the nest and climb up into trees, where they live on the underside of leaves. They stay there until they are too heavy, when they return to the ground. Nearly half of all the species of invertebrates designated as protected species in New Zealand occur only on offshore islands. Proper island restoration and management are necessary to preserve their genetic diversity. The variation within the Placostylus species has been related to population isolation and size. For example, Placostylus bollonsi has inhabited the Three Kings Islands, separated from the mainland, for several million years. Redistributions of populations have been attributed to human translocation (anthropic redistribution), which may have been on purpose - for food - or unintentionally. 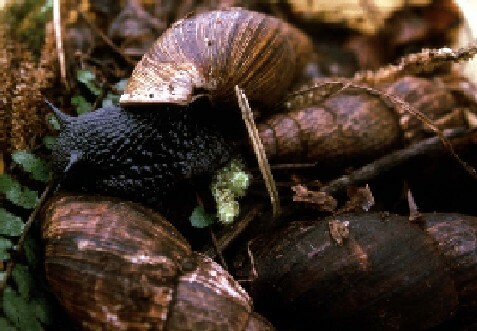 Since the arrival of humans in New Zealand habitat destruction and introduced predators (especially feral pigs, but also rats, mice and possums) have severely reduced the population sizes of flax snails, some to extinction or near extinction, and increasingly isolating the remaining populations. Studies of rodent-free islands like Maud Island off the South Island coast report rich invertebrate faunas in terms of diversity and density and the presence of unique species, and give rise to hope for manageable refuges for endangered species. Many thanks for the photograph from Ian Stringer, Department of Conservation. Brook, F. J. and B. H. McArdle (1999). Morphological variation and biogeography of Placostylus hongii (Gastropoda: Bulimulidae), northern New Zealand; Journal of the Royal Society of New Zealand 29(4): 407-434. Gibbs, G.W. (1990): The silent majority: a plea for the consideration of invertebrates in New Zealand Island management; in: Towns, D.R.,Daugherty, C.H., and Atkinson, I.A.E. (Eds.). Ecological restoration of New Zealand islands. Conservation Sciences No.2: 123-127. Hayward, B. W. and F. J. Brooke (1981). Exploitation and redistribution of flax snail (Placostylus) by the prehistoric Maori; New Zealand Journal of Ecology 4: 33-36. Jones, J. (2001): Land snails; Heinemann Education, Reed Publishing, Auckland. Sherley, G. (1996). Morphological variation in the shells of Placostylus species (Gastropoda: Bulimulidae) in New Zealand and implications for their conservation; New Zealand Journal of Zoology 23: 73-82. Triggs, S. and G. Sherley (1993). Allozyme genetic diversity in Placostylus land snails and implications for conservation; New Zealand Journal of Zoology 20: 19-33.